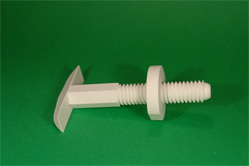 Oxide ceramics - IZOKERAM Co.Ltd. Our materials with high aluminium-oxide content are rather called artificial precious stones because these ones are consisted of the same components like ruby and sapphire generated in the nature. These precious stones were generated when the earth’s crust was created. At that time the giant pressure and temperature transformed the aluminium-oxide being in the earth’s crust to corundum crystals (it is basis of our production process, as well). The ruby became pink because chrome-oxide got in the corundum crystals and the sapphire became blue because small quantity cobalt-oxide got between the crystals. 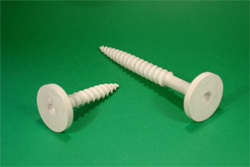 The aluminium-oxide ceramics have special mechanical characteristics. These special characteristics are the results of the ceramics’ micro structure and chemical composition which can be achieved through various technological processes. 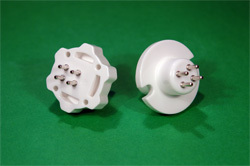 The oxide ceramics with 92% aluminium-oxide content, generally used in our plant, is highly resistant to thermal shock; it has a great high-frequency loss, its sintering temperature is 1550 Co, and its colour is white. 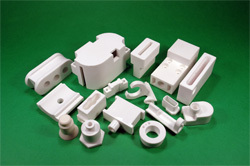 In order to meet the requirements of our customers, we can colour the ceramics’ base material or we can apply any colour from the RAL colour chart to the surface of the white ceramics. 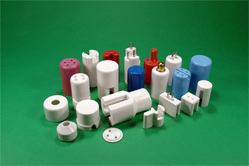 Many fields of practical life require special properties of oxide ceramics!